Influential farming and business organisations in Northern Ireland have urged the Democratic Unionists to drop their opposition to the draft Brexit deal. 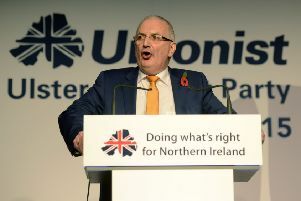 The Ulster Farmers Union (UFU), which represents thousands of farmers, many of whom would traditionally vote DUP, has called on the party to vote for the text, claiming a no-deal Brexit would be “absolutely disastrous” for the farming and agri-food sector in the region. The DUP, which styles itself as a pro-business party, is facing similar calls from figures within the commercial sector. The party’s chief whip, Sir Jeffrey Donaldson, has also faced criticism after claiming some of the agricultural and business bodies supporting the deal had not read the 585-page document. The DUP has vowed to vote down Theresa May’s deal, claiming the proposals for an Irish border “backstop” will see Northern Ireland treated differently to the rest of the UK. The party has insisted the accord, if passed, would undermine the constitutional integrity of the UK. The UFU, an organisation representing the interests of 11,500 family farms in Northern Ireland, called on the DUP to change tack. The Federation of Small Businesses has also backed the deal. FSB NI policy chair Tina McKenzie said: “We believe that the Withdrawal Agreement is a significant step back from the cliff edge which would result in a chaotic no-deal Brexit that would be deeply damaging and dangerous for our small firms. On Thursday, Northern Ireland Secretary Karen Bradley briefed a range of key local business figures on the detail of the deal. The attendees at the Belfast meeting were members of the Northern Ireland Chamber of Commerce and Industry (NI Chamber). Afterwards, John Healy, vice-president of NI Chamber, said the reaction was broadly positive. “The consensus around the table is generally there are a lot of positives there for business,” he said. On Thursday night, during an appearance on BBC One NI’s The View, Sir Jeffrey was asked to respond to comments supporting the deal from the UFU and a senior figure within the Northern Ireland food and drink sector. “They are wrong,” the DUP representative replied. The Lagan Valley MP added: “I don’t believe they have read the detail of this, they have not read the 500 pages. “There are serious constitutional and economic implications of this deal for Northern Ireland”. Ian Marshall, a former UFU president who is now a senator in the Irish parliament, accused Sir Jeffrey of being “disrespectful”. “These are the industry captains of business in the agri-food sector in Northern Ireland,” he told The View. “These guys have read the document, have examined the document. I have read the document, I have looked through it. “It’s actually a very credible piece of work. It’s a very complicated piece of work. “But I think it’s completely disrespectful to imply that those individuals tonight haven’t read, or don’t understand, this piece of work.